Click here for an interactive map of conference locations, and instructions for accessing special events. Historic preservation faces enormous challenges in a time of rapid change. This conference will examine the most innovative methods and strategies for upholding and instituting historic preservation, both across the state and in the dynamic, high-tech region of the Silicon Valley. See iconic historic places in tours, mobile workshops, and engaging conference sessions. 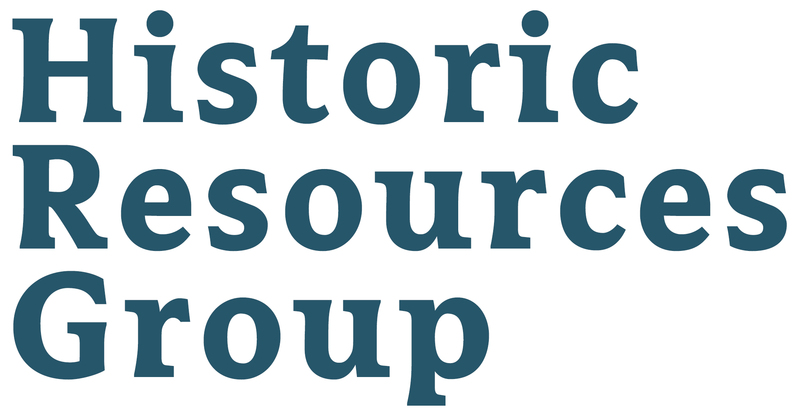 Come together to explore how historic preservationists, affordable housing advocates, architects, designers, planners, engineers and more can partner together in upholding our cultural heritage in a fast-paced, economically vibrant state and region. 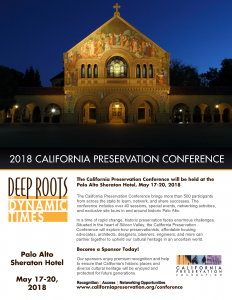 Join the California Preservation Foundation, The City of Palo Alto, and Palo Alto Stanford Heritage (PAST) at the Sheraton Palo Alto Hotel to celebrate the deep historic roots of a dynamic, culturally diverse, high-tech region and state. The California Preservation Conference will be held at the Sheraton Palo Alto Hotel. Additional rooms are available at the Cardinal Hotel. How do we manage change in the midst of massive economic shifts? How do we maintain the connection to our heritage when faced with housing shortages and climate change that threaten to erase whole communities? How can preservationists help to improve social cohesion, adapt to technological advances, and promote community identification? Silicon Valley is at the epicenter of many of these changes, which reverberate in communities across the state. The Plenary Session at the 2018 California Preservation Conference brings together a distinguished panel to explore the common threads that unite us, as community members and advocates, in times of significant change. The Plenary Session is free and open to the public. Friday, May 18, 9:00-10:30 AM at St. Thomas Aquinas Church. Rachael Myrow is KQED’s Silicon Valley Arts, Culture & Tech Reporter. You can hear her work regularly on NPR, Here & Now and the KQED podcast Bay Curious. She also periodically guest hosts for KQED’s Forum. Suzanne joined Equity Community Builders in 2005 as a Project Manager and became a Principal in 2014. Suzanne’s energy and passion for the community is evident in her work and personal life. She brings comprehensive knowledge of the development process, design and project management, construction management, and sustainable building practices. As an advocate for sustainable design and construction, she has managed numerous LEED projects including two LEED Platinum buildings. Suzanne received her B.S in Civil Engineering with a minor in Architecture in 1992 from Rensselaer Polytechnic Institute in New York and her Masters in Structural Engineering in 1997 from Georgia Tech in Atlanta. She holds both Professional Engineer and Structural Engineer licenses in California. Laura’s projects range from the Kendall Square Public Realm Plan for Cambridge, MA to Pier 70, a 35-acre acre mixed-use development on San Francisco’s waterfront. Laura’s work investigates the social and political power of space. Her projects range from Pier 70, where she is leading a multidisciplinary design team through the design and entitlement of a thirty-five acre mixed-use development in a historic industrial district of San Francisco to a 300-pixel infographic for the Silicon Valley homeless services non-profit Destination Home. Prior to forming SITELAB, Laura was an Associate at Gensler, an international architecture firm where she worked on projects for UCSF, Kaiser Permanente, Hewlett-Packard, Sonoma County, and the US General Services Administration. She has written and lectured on placemaking, art in cities, temporary urbanism, and the urban impacts of the way we work. She teaches on Design and Activism at UC Berkeley. Laura earned her Masters of Architecture from Harvard. Laura serves on the board of The Greenhouse Project and, from 2010-2012, on the Board of Directors for AIA San Francisco. David Lenox has been the Stanford University Architect since 2005 and has been focused on establishing a framework for continued physical growth of the campus to support the mission and vision of the University. He has led the development of a campus master plan which outlines strategies to restore the original Olmsted campus plan, and has also collaborated with the individual schools and departments to create a system of district plans and architectural guidelines for the Graduate Business School, Law School, Biological Sciences, School of Engineering, School of Medicine, Housing, and the Arts. Jay Turnbull has been an architect and urban designer in San Francisco and New York, where he worked at Skidmore, Owings and Merrill—gaining early experience on an urban scale—and the New York City Office of Midtown Planning & Development. He was Architect of San Francisco Architectural Heritage for five years while maintaining a practice in historic architecture. In 1981, he joined Page & Turnbull to direct architectural work. His thoughtful and deliberate approach to the restoration of historic buildings has been applied to projects throughout California, touching nearly every important historical renovation project in San Francisco. Former president of San Francisco Architectural Heritage and a Peer Reviewer for the U.S. General Services Administration Design Excellence program, he has published and lectured widely on preservation related matters. He has been preservation architect for numerous National Register and locally recognized landmarks and has consulted extensively on the seismic retrofit of historic buildings. His work has been honored by the National Trust for Historic Preservation, American Institute of Architects, California Preservation Foundation and other national, regional and local organizations. The Plenary Session is sponsored by Page & Turnbull. For detailed descriptions of each event, look inside the program book here. Unless indicated otherwise, tours and workshops pick up in front of the Palo Alto Sheraton Hotel. 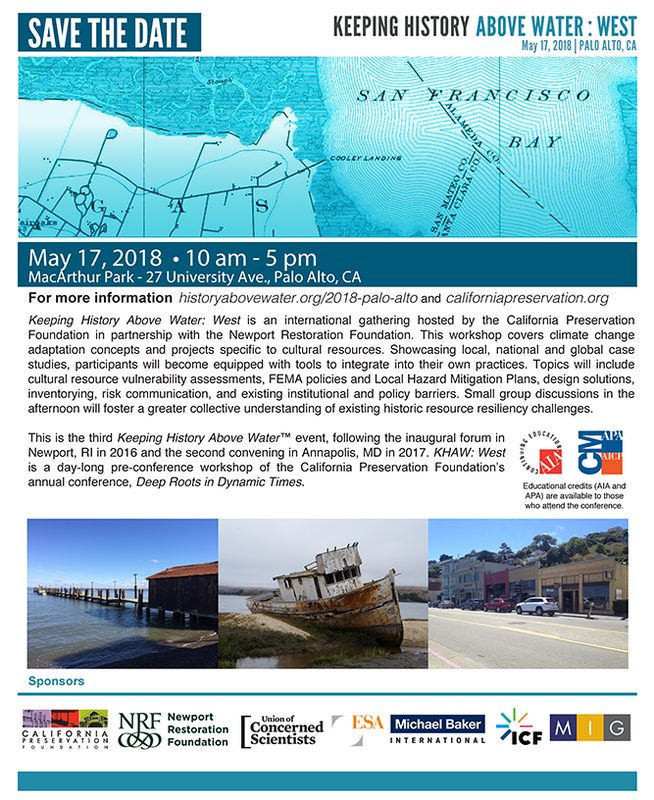 Join the California Preservation Foundation for the first ever West Coast edition of Keeping History Above Water! 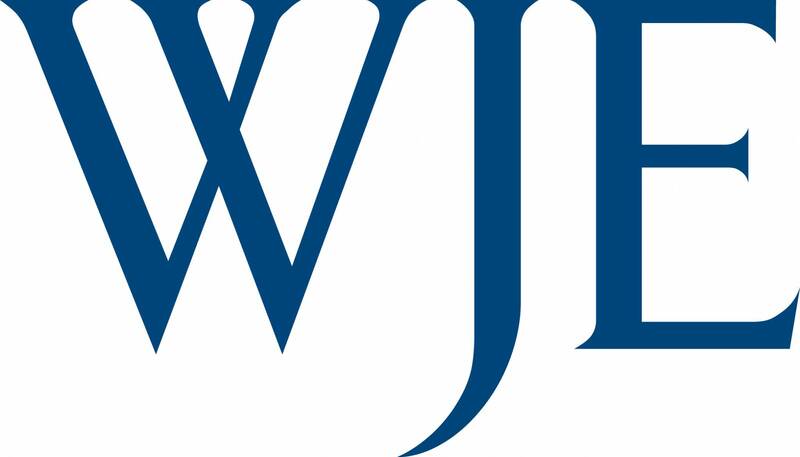 This effort began in 2016 as a conference in Newport, Rhode Island and has now expanded to support continued dialogue on climate and cultural heritage across the world. This all-day workshop will convene practitioners to discuss local, regional and nationwide practices specific to cultural resources and climate change. How can communities identify, prioritize and adapt historic places to the threats posed by climate change and natural disasters? Participants will be equipped with tools to integrate into their own practices. Topics will include cultural resource vulnerability assessments, FEMA policies and Local Hazard Mitigation Plans, site and community adaptation strategies, design solutions, inventorying, risk messaging, and existing institutional and policy barriers. Small group discussions will also foster a greater collective understanding of existing challenges on historic resource resiliency. As a Conference Sponsor or Advertiser you will have access to many opportunities to promote your products and services to preservation professionals from across California. Purchasing advertising space in the Conference Program ensures that over 500 professionals, government staff, and non-profit leaders will see your company’s ad and recognize your commitment to historic preservation. All ads are full-color and sizes range from 1/4 page to a full page. Join the California Preservation Foundation for the first ever West Coast edition of Keeping History Above Water! This effort began in 2016 as a conference in Newport, Rhode Island and has now expanded to support continued dialogue on climate and cultural heritage across the world. This all day workshop will convene practitioners to discuss local, regional and nationwide practices specific to cultural resources and climate change. How can communities identify, prioritize and adapt historic places to the threats posed by climate change and natural disasters? Participants will be equipped with tools to integrate into their own practices. Topics will include cultural resource vulnerability assessments, FEMA policies and Local Hazard Mitigation Plans, site and community adaptation strategies, design solutions, inventorying, risk messaging, and existing institutional and policy barriers. Small group discussions will also foster a greater collective understanding of existing challenges on historic resource resiliency. A stroll up Palm Drive through the historic Main Gates to the University with stops at the Angel of Grief, Stanford Family Mausoleum, Arizona Garden and Chinese Laborer Quarters archaeological research site. The tour will be co-hosted by the Stanford Historical Society and docents will be present at all the stops. Docents will include University Archaeologist Laura Jones and the restoration leaders for the Arizona Garden project, Julie Cain and Christy Smith. Stanford University, established in 1888, represents a powerful and innovative campus plan, designed by Leland and Jane Stanford collaboratively with MIT president General Francis Walker, architectural firm of Shapley Rutan and Coolidge a successors of Henry Hobson Richardson and landscape planner Frederick Law Olmsted. Two significant earthquakes severely impacted the historic campus, in 1906 and 1989 and partially altered the original architecture. Multiple generations of campus architects, planners and industry experts have contributed towards the repair and strengthening of these buildings to ensure that the campus and its resources are retained and restored for current and future generations. This study tour will introduce the historic background of the campus and the recovery after the 1906 earthquake. It will also include the post 1989 work and the establishment of a seismic safety program that was instrumental in the preservation of significant historic buildings. The walking tour will feature the historic quad and adjacent buildings, and the major restoration projects completed from 1989 through 2017. Silicon Valley is synonymous with cutting-edge high-tech enterprise, with a reputation founded on science, technology, engineering, and mathematics (STEM) research. NASA Ames Research Center and Moffett Federal Airfield represent one of the first high-tech research and design centers in Silicon Valley. This bus tour explores the Naval Air Station Sunnyvale and Ames Wind Tunnel Historic Districts and offers perspective on the dynamic challenges of balancing the mission of a scientific facility with historic preservation; interpreting levels of significance related to important scientific research; and incorporating new uses and infrastructure into historic districts. Stops will include viewing the iconic Hangar One, Shenandoah Plaza, and wind tunnel facilities (subject to availability). In addition, the tour will visit the vacant International Telephone and Telegraph (IT&T) Building in the Baylands, a resource representing obsolete technology that offers unique preservation challenges. This tour requires valid identification for all participants to restricted sites; advanced notice of foreign-national participation is required. Explore the historic core of downtown Palo Alto centered on University Avenue. The walking tour will illustrate the expansion of the 1890’s business and residential district into the 20th century. The tour will follow the growth and cultural changes that continue to shape the City. Sample buildings include the historic Ramona Architectural District (1924-1938) by Pedro De Lemos; the Medico-Dental building (1927) by Birge Clark; and the Stanford Theater (1925), a former movie palace; and the First Church of Christ Scientist (1916). Students in Heritage Conservation, Public History, Historic Preservation, and related fields are often exploring cutting-edge or out-of-the-box preservation methods in their studies. Each year, the California Preservation Foundation and its Higher Education Committee select exemplary students from a pool of submitted proposals at universities and colleges in California, Washington, and Oregon. Each student is allotted 15 minutes to talk about their research and findings. Topics could range from materials conservation to community engagement, survey methods, documentation, cultural landscapes, and more. This is an opportunity to learn from the best young minds in preservation on the West Coast. How can you nominate a property that doesn’t seem to fit in the traditional categories? How does the Office of Historic Preservation review nominations of unique and unusual resources? Join the staff of OHP’s Registration Unit for profiles of some of the most interesting properties recently nominated to the National and California Registers, and how consultants, communities and cities successfully listed one-of-a-kind properties. 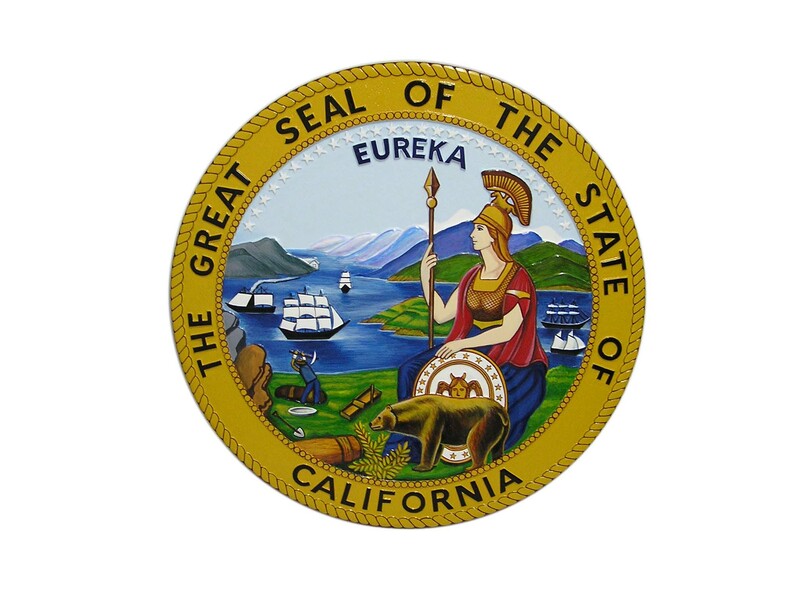 The session will explain how to assess a property that doesn’t seem to fit the traditional National Register mold, and factors concerning eligibility for California programs that may be better suited for some property types. CEQA is always changing and this panel discussion will examine recent trends and changes in the way CEQA is being interpreted. We’ll begin with an overview of recent case law and then turn to a lively panel discussion covering exemptions, thresholds of significance, impacts, cumulative factors. Bring your tough questions for the panel to discuss. Historic neon signs represent neighborhood gathering places where generations have met to watch movies, drink martinis, buy groceries, and even park cars. The surviving neon signs that shine in our California landscape cut across almost all cultures and lifestyles. They are not disposal advertising, but a bridge between the past and present. They have become community landmarks. Speakers Al Barna and Randall Ann Homan are the authors and photographers of San Francisco Neon: Survivors and Lost Icons (Giant Orange Press 2014). They are currently working with local experts to develop a practical preservation guide called Neon Best Practices. What are the best practices to preserve and restore these neighborhood icons? This talk will take a look at four iconic signs in the Bay Area, the struggle to preserve and restore them, and the neon best practices that may, or may not always be part of the plan. These four signs include the Carlos Club sign in San Carlos, the Eastern Bakery sign in San Francisco, the Stephen’s Meat Products dancing pig in San Jose, and the Joe’s of Westlake sign in Daly City. This mobile workshop will focus on efforts undertaken by Palo Alto residents to preserve the city’s 2,500+ Mid-Century Modern residences built by Eichler Homes, Inc. Palo Alto contains the highest number of Eichlers of any city in California, and the neighborhoods are home to many residents who have advocated for the preservation of their architecturally distinct homes. The workshop will involve a walking tour of Greenmeadow, one of the city’s two National Register-listed Eichler neighborhoods, where community members and Eichler experts will discuss the history and distinctive characteristics of Eichler homes. Participants will listen to a panel discussion held at the Greenmeadow Community Center, featuring City staff and Eichler residents who have been involved in local planning and advocacy efforts. Panelists will explain existing tools used to preserve the character of Eichler neighborhoods in Palo Alto, which include architectural control committees, the City’s Single-Story Overlay zoning districts, National Register designation, and the new Eichler Neighborhood Design Guidelines. The discussion will also address tensions that have arisen in the community because of development pressures in these low-density suburban neighborhoods. This workshop will provide hands-on learning about tech tools available to assist in the important tasks of investigating and documenting historic structures, landscapes, and other features. Documentation tools demonstrated include laser scanners and drones, a rapid growing and changing technique to help expedite documentation of physical configurations and dimensions with ease. Investigation tools to be demonstrated include ground-penetrating radar (GPR), used to detect reinforcing steel and structural steel in existing structures, and the resistograph, used to detect hidden decay in wood members. Experts will discuss and demonstrate use of tools, followed by opportunities for participants to try tools out first hand. What to do when zoning conflicts with historic preservation. For years, preservation regulations have been stand-alone ordinances with their own review processes for determining significance and appropriateness. These function as overlays on top of base zoning, which sometimes contradicts preservation objectives. Today communities are seeking ways to synchronize preservation regulations with zoning. This session will explore how this has proceeded in Los Angeles, Montery, and elsewhere. It’s Old, So What? What Makes Significance So Significant? This advanced panel discussion will focus on why, when, where, and how properties become significant. Significance is a tricky subject that even professionals (and their lawyers) disagree on, especially with vernacular resources and within districts. Our panelists have expertise with projects large and small, working with the California Department of Transportation, National Park Service, and California Office of Historic Preservation. From local landmark evaluations for cities with “antiquated” and “creative” ordinances to National Register nominations, each situation is unique, but significance is always the starting point. Find out why. The session will make use of case studies in Northern California and will encourage audience participation. Three speakers will present three distinct case examples from across the state that examine their work on historic sites associated with underrepresented cultural groups. First, Stacey De Shazo reveals the history behind the Japanese Architecture “hidden” in Oakland’s Chinatown. Second, Sally Evans, examines how the demolition of a 1940s lumber building in Sebastopol uncovered a little-remembered piece of Sonoma County’s Asian American history, including how and why a California Chinatown was lost and forgotten. Finally, Erica Thompson, covers her experience working on The Allensworth Cemetery. What can we learn from a graduate student’s quest to amend the Allensworth Historic District to include the cemetery? Much of our self-reflection and story-telling as preservationists focuses on successes, from a well-executed adaptive reuse, to the victorious use of a federal tax credit, to the implementation of an active preservation program or ordinance. But it’s easy to forget that the preservation movement has often rallied around failure to mobilize the public and achieve legislative victories – the best example being the 1963 demolition of Penn Station encouraging the enactment of the National Historic Preservation Act in 1966. How can we learn from our failures here in California? What lessons should we gather from our losses? And how can we use our failures to achieve success later? This session will examine case examples in preservation ‘failure,’ from small to large – from the demolition of the Mare Island Smokestack and loss of Yerba Buena Island’s 1914 Signal Tower, to Los Angeles’ no vote on designating the Parker Center, and more. The session will end by asking the audience to share their failures with a panel of experts in environmental law and advocacy who will critique their process and offer advice for future efforts. This session highlights the efforts to bring voices from African American, Asian American and Pacific Islander, Latino/a, and LGBTQ communities to the center of the conversation in historic preservation. How can we re-center voices that have been marginalized in historic preservation? Each panelist will present their work in historic preservation in their respective communities with topics on: (1) working within these communities as it relates to historic preservation, (2) working with preservationists on these communities, (3) best practices and challenges in working with and in these communities, and (4) best practices and challenges in advocacy, technical documents, and community engagement. This course session covers blending new and old technologies in the restoration of historic building materials including wood, brick repair and terracotta repair. Both old and emerging treatment procedures for each material and investigation and testing techniques are discussed. These procedures include new materials and computer programs. The case study used is the rehabilitation of the Carson Block, one of the more significant, recent historic building rehabilitations in Humboldt County (Eureka) behind the redwood curtain. The stereotype of Hispanic communities in California has been in either urban centers, Southern California or San Francisco, or the small agricultural communities of the Central Valley. One of the lesser known is that of the Santa Clara Valley. One of the earliest Spanish settlements in California, it became one of the most significant Mexican American communities in Northern California as hub of a regional network of migrant labor and settled worker communities. Over the last ten years, through cultural resources studies (including the Chavez NHL Study), interpretive projects, and historic property nominations, more of this history has been documented than during any previous period. While archival sources were often minimal, much of the documentation has been facilitated through community history projects, which enlist community members as researchers, bilingual oral history projects, and the collection of personal archives. This program will visit the sites of some of these ongoing projects. Community members and researchers will share personal stories, and project coordinators will share their strategies for creating community-based and community-oriented preservation projects. 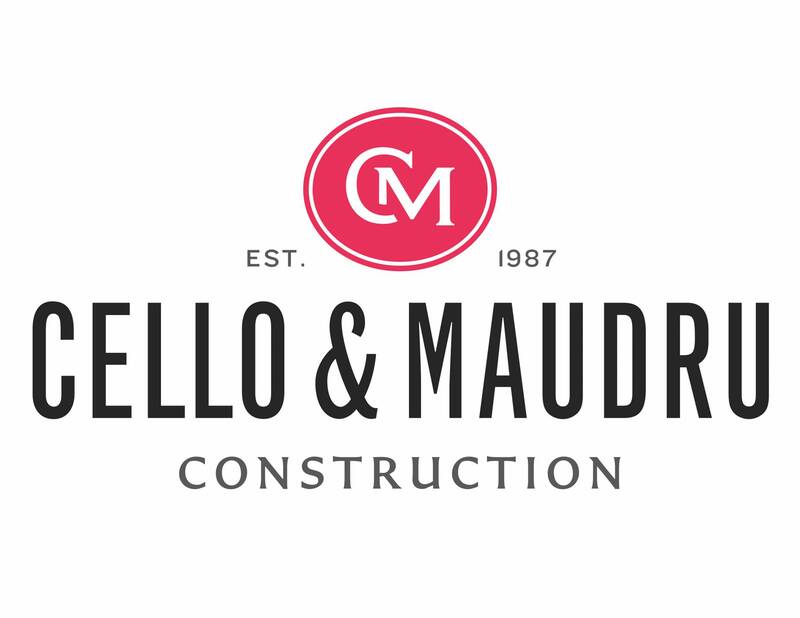 Josie Talamantez, Public History & Arts Management Consultant, JST Inc.
Mike Garavaglia, AIA, LEED BD+C Principal, Preservation Architect, Garavaglia Architecture, Inc. Many properties can readily be rehabilitated, preserved, or restored””but some prove extremely difficult to maintain in a feasible and appropriate use. Some of these are altered inappropriately. Others remain vacant and deteriorate. Some are demolished. But for some properties that seem impossible to reuse, a new life can be found. This session will present case studies from around the state, including buildings, sites, structures, and landscapes. These will include properties that were successfully reused; others that were altered inappropriately in order to accommodate a new use – or were rehabilitated appropriately but did not meet operational expectations; and also properties that have remained vacant, were demolished, or were redeveloped with no element of preservation. Using the case studies, the session will consider factors that make properties challenging to maintain in ongoing use. We will explore the ingredients of success and the pitfalls that preservation efforts have encountered. The session will look at the strategies that have worked and the roles preservationists can fill. We will also discuss options preservationists may have to confront: Is a project which does not conform to the Secretary’s Standards better than no project? How can stakeholders buy time for a property? What are last-ditch alternatives? In this session we will present a brief history of the programs, including the new deliverable guidelines for drawings, historic photos and digital printing. Although HABS/HAER/HALS have the same basic components, they all have unique challenges for photography, research and measured drawings. Case studies will be presented to highlight the challenges of coordinating the varies parties, technical challenges and research methodology. We will discuss the use of a 4×5 film camera, unique properties of film vs. digital and archival storage. A Q&A/panel discussion to follow. Frank Lloyd Wright is widely celebrated as one of America’s greatest architects, but the architects that trained at Taliesin and worked for him are just now emerging as great architects in their own right. These architects, including Aaron Green, Mark Mills, John Lautner, and Daniel Libermann have played a pivotal role in cementing California as a center of post-modern, organic architecture. Despite California’s rich collection of architecture by FLW apprentices and proteges, such structures are often most at risk. The revolutionary, whimsical designs of these master architects may neither be old enough to pass the “50-year” threshold, nor monumental (or imposing) enough to be assumed sacrosanct. This three-hour exploration of the post-Frank Lloyd Wright era of organic architecture will be divided into two functional parts, with a short intermission between. Part 1 (9:00 AM – 10:30 AM) will examine the key master architects who worked with or were inspired by Frank Lloyd Wright and went on to create identifiable styles of their own. Examine the works of these architects, their history and association with FLW, and the character defining features that comprise their designs. The session will close with a panel discussion among all speakers to examine ways in which advocates, architects, planners, structural engineers, and other professionals can work collaboratively towards developing a comprehensive strategy for the protection of these unique, threatened resources. What types of intervention are appropriate and necessary in order to protect the buildings, both from natural hazards and development pressure? Which features of these structures make them resilient, and which features make them vulnerable in the face of fire, flooding, or seismic threats? The panel will discuss common tools and techniques used in their professional lives to ensure the protection of these irreplaceable, uniquely “Californian” works of architecture. This session will explain how the use of aerial drones, or Unmanned Aerial Vehicles (UAVs), can improve the documentation and assessment of buildings and even cities. Drone technology has rapidly evolved in the last several years. New drones have better controls, collision-avoidance sensors, high-res cameras, and more affordable prices. Drones are easier to fly and can provide views that were previously impossible to obtain. Improved stability and HD cameras also provide broadcast-quality video for documentaries and marketing. In recent years there have been efforts to preserve, research, and celebrate San Francisco’s LGBTQ history using a variety of approaches that deviate from standard preservation practice. From adopting a citywide historic context statement, to establishing the Ringold Alley Artwalk, and creating a LGBTQ Cultural Heritage Strategy, San Francisco is getting creative in incorporating the rainbow layer within its history. This session will explore the more tangible aspects of San Francisco’s LGBTQ history but will also examine how the more ephemeral aspects of history are being interpreted. A National Historic Landmark and part of the Golden Gate National Recreation Area, Fort Mason Center is home to 35 nonprofit organizations focusing on the visual and performing arts, humanities, education, ecology, and recreation. After the transfer of the military base to the National Park Service in 1972, Fort Mason Center was established to oversee the adaptive re-use of three piers and seven buildings into a nonprofit arts center. The San Francisco Art Institute (SFAI) was founded in 1871 and is one of the nation’s oldest and most prestigious schools of higher education in contemporary art. In 2014, LMSA provided services to rehabilitate and seismically upgrade the 104-year-old Pier 2 shed to include the 450-seat Cowell Theater and is currently completing phase 2 of the Pier 2 project with SFAI on the relocation of their Graduate Center to the historic pier shed. The project includes 154 graduate studios, workshop, gallery, and media theater, and serves to expand upon the institution’s national reputation of experimentation, risk-taking, and innovation. Working closely with the National Park Service and State Historic Preservation Office, the Graduate Center has been inserted into Pier 2 in strict conformance with the Secretary of the Interiors Standards for Rehabilitation. California State Parks and their partners have been utilizing various new technology in support of their mission to preserve and protect the state’s most valued cultural resources. This session will explore recent projects undertaken in some of California’s most iconic State Parks including Bodie, Hearst Castle and Emerald Bay. The Bay Bridge Steel Program, administered by the Oakland Museum of California (OMCA), was created in response to significant public interest to preserve and celebrate the legacy of the decommissioned 1936 East Span of the Bay Bridge through repurposing and reusing the salvaged steel in public and civic art projects. The program recently completed the multi-year process of solicitation and selection of proposals, and awarded steel to fifteen successful projects in various locations including Oakland, San Francisco, Napa and Marin Counties, Truckee/Tahoe and Joshua Tree, California. This moderated panel discussion will share the experiences of the administering agencies, the program administrator, and selected awardees as they worked together to preserve the historic landmark in public spaces across California. It will share the grass roots effort to initiate the program and galvanize support across multiple public and non-profit agencies. The speakers will also discuss the criteria and selection process used to distribute the steel, as well as the technical challenges associated with salvaging and re-using the archaic steel elements. Around Mid-Century, the boldly conceived BART system attracted worldwide attention as the nation’s first high-speed electrified light rail system that also facilitated the development of the first regional master plan for several San Francisco Bay Area counties. When the futuristic BART vision came to fruition in 1972, it was at a time when standardization in the building industry was considered rather innovative. Yet BART’s progressive mandate to diversify individual Bart station designs as conceived by prominent leaders of the Bay Area’s Mid-Century Modern Design Movement such as Ernest Born, William Wurster, SOM and Gardner Dailey resulted in unique structures that responded to the context of their assigned sites while engaging the local environment. The HUD Honor award for BART’s “overall design excellence” and AIA’s “Collaborative Achievement in Architecture Award “were both conferred with national acclaim. Almost half a century later, the BART system continues to be relevant as it regenerates itself, embracing uniform designs and conventional building materials to renovate or replace existing Modern structures. As “the new modern” era of the BART system commences, it is imperative to understand and evaluate the original vision of BART’s Mid Century design and architecture, illustrated by selected case studies of SF Bay Area’s Modern BART stations. Cities across California possess historic resources which may be labelled “unwanted.” These are former military, industrial and medical sites, warehouses and jails, which lost their functions years ago. Many of them are not designated at any level although they may retain historic and architectural values. Preserving and restoring them would become possible only after determining new functions, which requires a careful study of all cultural, social and economic aspects of the site. Homer Avenue in Palo Alto presents an astonishing collection of “reborn” historic buildings with a variety of original and new functions. The case-studies include creative offices in former laundries and bakeries, a museum in a former medical building, a Whole Foods store in a car dealership and many more. Presented by the experts involved in their revitalization, these examples illustrate the possibilities and limitations of successful adaptive re-use. Mid-century modern enthusiasts will delight in this film celebrating the passion of homeowners, architects and fans of the homes built by Joseph Eichler in California between 1949 and 1974. <em>People in Glass Houses</em> is the first film to explore the legacy of the Eichler phenomenon and seeks to discover what makes these homes so compelling. Featuring interviews with seven Eichler owners in the San Francisco Bay Area, as well as conversations with Ned Eichler, son of Joseph Eichler, and Paul Adamson, noted author, Eichler historian and architect. “People in Glass Houses” is a collaboration between Mid-Century Modern Realtor, Monique Lombardelli, Director, Kyle Chesser, a Eichler home owner for over 10 years and Editor/Director of Photography, Andrew Corpuz. You will get an historic overview of Joseph Eichler and how he got his start in developing Mid Century modern neighborhoods. Winner of the CreaTV Full-Length Documentary award and written about in magazines like Dwell and CA Modern Magazine, this is a must see film! The 45-minute documentary film screen will be followed by a panel discussion among the film’s Producer, preservation experts, and Eichler aficionados. Developing appropriate responses in historic rehabilitation or new construction projects requires involvement in design process. Design challenges arise from architects, advocates and compliance reviewers perspectives. These involvements in CEQA resource reviews often changes the design approach. Case-study examples will demonstrate different preservation design issues, drawing from historical and modern- era precedents. Examples will include additions to historical structures, faÃ§ade alterations, new “ground-up” construction compatibility in historic contexts, and historic landscapes interaction. A panel of distinguished project reviewers representative of state and local agencies and advocacy groups will discuss proposed projects. Interactive discussions with audience and panelists are typically lively. A special behind-the-scenes Architectural tour of Filoli, the spectacular 1915 “Georgian” estate designed by Willis Polk belonging to 2 important families, the Bourns and the Roths, now owned by the National Trust for Historic Preservation and co-stewarded by the Filoli Center. The tour includes a boxed lunch and special lecture and time to explore 16 acres of world-renowned gardens. As modern and recent past resources advance in age, practitioners face new challenges in survey and documentation, conservation of popular materials of the era, and perception of their historic value. Sessions will explore the breadth of resource types of this era from transportation and housing to corporate landscapes. Sessions will offer case studies in mid-century surveys, best practices for design guidelines for midcentury suburban development, and offer effective ways to advocate and protect unique houses of Modern design from threats of redevelopment and climate change. This track explores new and emerging issues that affect preservation planning at the local level: new laws and case law concerning CEQA and local planning; planning concepts for local planners, including form-based codes and other ordinance models; methods for navigating local significance determinations; and how to use lessons learnt to create more successful preservation projects. Explore the ever-changing environment of assessing and documenting existing buildings, from discussing updates on the National Park Services Heritage Documentation Programs to exploring emerging technology tools and practices. Sessions include innovative documentation techniques used on recently completed projects, demonstrations of new and emerging technologies, and the balance and blending of new and old technologies on documenting the past. Heritage professionals and community advocates in California have pioneered new approaches in historic preservation by engaging socially diverse groups who have contributed vitally to the state’s cultural history. In this track, you will learn more about inclusive-oriented preservation and how preservationists work with communities to expand the boundaries of their practice. Presenters will highlight successful partnerships and important lessons learned to improve future engagement efforts. As our buildings age, so do the unique structures, landscapes, art, and signage that help define our history. Sessions in this track will look beyond the building to explore the challenges in evaluating, documenting, and preserving unusual historic resources, and study projects that have creatively integrated the non-traditional built past in planning for the future. Three-Minute Success Stories is an opportunity to present your very own preservation success story! Participants at this lively event have shared stories of buildings restored after earthquakes, giant industrial cranes being relocated, enlightening adaptive reuse, modern architecture coming of age, community efforts overcoming all odds to save an important local landmark, and historic places saved from bulldozers at the last moment. Be adventurous! The Three-Minute Success Stories has been a California Preservation Foundation tradition since the 1978 Conference. While humor often comes to the fore, the program also gives preservationists a chance to present local successes to a statewide audience, sharing a variety of preservation experiences in exciting and entertaining ways. Please include a brief description (no more than three paragraphs!) of your success story and explain why it would interest conference attendees or teach them something that they would like to know. NOTE: Submission of PowerPoint with your application or ASAP after the deadline will greatly facilitate dress rehearsal coordination. Be sure your CD is “self-supportive”. When saving your PowerPoint presentation to your CD be sure to click on “Package for CD” command to add all related extension applications. In addition, you should not have to click to change the slides or play the music. A PowerPoint projector and laptop are the only technical equipment provided for the program. Will you be using props? For example, please let us know if you need special equipment/hookups. Please include the names and addresses of every person who will be presenting your story. Do you want a front row seat to California’s premier statewide preservation conference? Volunteers are needed for a variety of activities including assisting with registration, sessions, tours, and special events during the entire conference. For every session you volunteer for, you get to attend a session for free! For those who are volunteering for workshops, events or tours you get to attend that workshop, event, or tour for free! If you are interested in volunteering, please submit the volunteer form after reading the volunteer information. All volunteers are required to attend a conference volunteer training session. If you have any questions about volunteering, please call (415) 495-0349 x200 or email cpf@californiapreservation.org.